I’ve talked quite a bit about the challenge of learning to cope once cancer treatments are over. Today, I’d like to introduce you to another survivor who has tackled this subject-retired attorney and interior decorator, Debbie Woodbury. Debbie was diagnosed with breast cancer in 2009. She went through a mastectomy and breast reconstruction, and though treatments were challenging, she found her biggest struggle waiting for her when it was all over. Without the proper support, however, Debbie says it was difficult to move on like her friends and family did, which led to a feeling of loneliness. 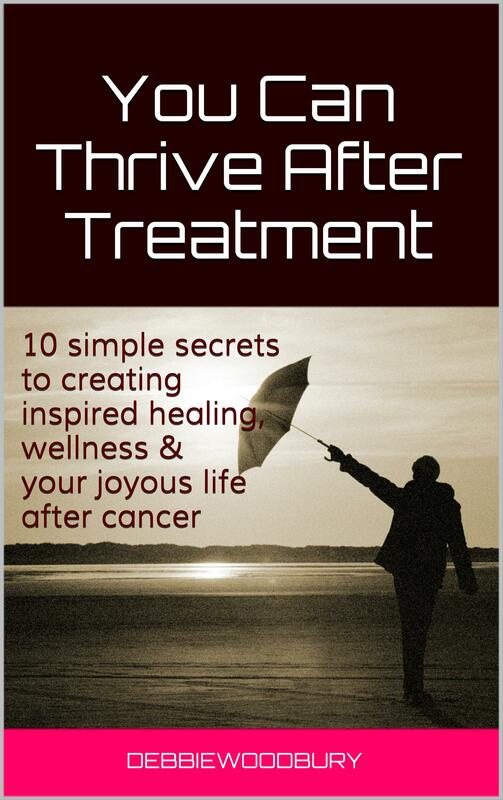 In her new book, You Can Thrive After Treatment, she helps survivors to find the help they need to truly recover and transition into a purposeful life. Though Debbie talks about surviving cancer, she’s quick to point out that going through treatments was no walk in the park. For her, the numerous tests and re-tests that led to her eventual diagnosis were extremely stressful. Debbie had no outward symptoms at the time, and she felt fine. She didn’t have breast cancer in her family, and considered herself a generally healthy person. Despite her challenges, Debbie made it through and found herself done with treatments and set back out into the world away from the cancer center. She was happy it was over, but found herself flooded with unwanted emotions. Debbie feels extra fortunate to have had that help, as she notes that only two years before, her friend had been in a similar situation at the same hospital, and there was no nurse navigator for her. Debbie was going through a rehabilitative exercise class at the cancer center, and it was the last day. She remembers talking to another woman who was also in the class and was also attending her last day. Acting on a desire to continue the conversation with other survivors-and to offer the kind of hope to others who didn’t have the support Debbie had found-she decided to put her experiences and what she’d learned into a blog and later, a book. If you’d like a copy of Debbie’s book, you can get it on Amazon or visit her website, Where We Go Now? for more information. Thank you so much for sharing my story with your readers. Like you, I am passionate about giving back in gratitude to other survivors for all of the help and support I got during my journey. Thank you for letting your readers know about my book, which I hope offers support and guidance to anyone making the transition from patient to survivor.